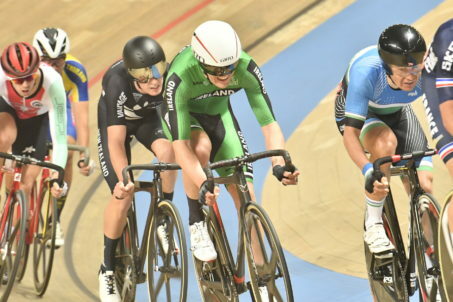 Ireland’s Mark Downey has won the 2019 Track Cycling World Championships Bronze medal in the Men’s Points Race at the Pruszkow Arena in Poland. The County Down rider struggled through the first half of the race, but with 40 laps to go took a lap, and sprint points. Recovering quickly, he took another lap, and entered the final nine laps sitting in joint third. Getting in a good position on the final bend, the 22-year-old pulled out everything to finish close enough for those crucial points that earned him World Championships Bronze. Mark Downey said: “That was crazy out there now. I’ve had so many ups and downs the last year and a half of my career. I had a crash on the track, finished fourth in the National Championships Road Race and I was bawling my eyes out after it. “I was always there or thereabouts in races, but, I never really picked up that win – I was beaten by inches in the summer at the Tour de l’Avenir – so I’ve had that feeling of being fourth so many times in my career. “I just got that urge with eight laps to go, I said: ‘I can’t feel like this again, this literally can’t happen to me again. If this happens to me again, I’ll get the nickname, the Nearly Man’. 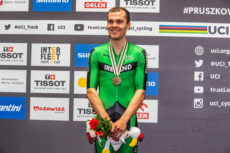 Downey’s medal is Ireland’s first UCI Track Cycling World Championships medal since Martyn Irvine won Silver in the 2014 Scratch Race, having won Gold in the same race in 2013, and Silver in that year’s Individual Pursuit World Championship. Downey will ride again at the 2019 UCI Track Cycling World Championships on Sunday, joining regular partner Felix English in the Men’s Madison – an Olympic event for Tokyo 2020.